Dear friends, valued customers, dear fellow crafters and textile-workers! Overdue (as a few people called it in recent days) – here are a few bits of news from in and around Flax-Mill and the world of textile-making. I sincerely hope you are well, prepared for the “forever coming” spring (??) and most of all happy! We have been keeping a little bit “quiet” recently. It was due to nothing else but a huge and seemingly never ending work-load here at Flax Mill. I can’t remember many months which were busier than February in a good number of years. March seems to go the same way, a few people had asked whether we are going to take a break around St. Patrick’s Day—we sure aren’t! The traditional 2X2 cloth (natural) we have been beetling for a few years now. Our “1/2 web” purple (pink weft woven into a blue warp) which turns into a real diamond after beetling (Those of you who watched the Charles Thompson film will remember Bruce Clark wearing a shirt made from it by Maria Cardenas). For the first time two runs of hand-woven linen. For both we used a natural warp, reverse-twist -spun (from Irish Flax), one is wefted with black, the other with a burgundy- red yarn. Both are real one-offs (30 metres only each) and there’s no need to tell you that they won’t be here for long (first come, first take…). Welcome to our new “Millie”! Visitors of last year’s Open Day will have noticed a new face at one of the weaving looms. Bronagh Skett is a native of Draperstown, lived in New Zealand for quite a while and was trained as a weaver there. Back in the home-place she has her own loom going and is doing part – time work for Flax Mill. Great to have her with us – at this point we are giving away a little secret: At our Open Day 2019 on September 14th we will for the first time ever present a mother-and-daughter-team of models during the Fashion Show, they will be Bronagh and her daughter Blaithin! Flax Mill outside Flax Mill! As every year we have turned down (and are still doing so) numerous requests to take stalls, do weaving demonstrations….at events like crafts-fairs, markets, vintage-shows, and so forth… Our busy schedule here and a few “must do events” abroad don’t allow us to spend much time outside the mill. Shanes Castle May Day Steam Rally on May 5th and 6th 2019! 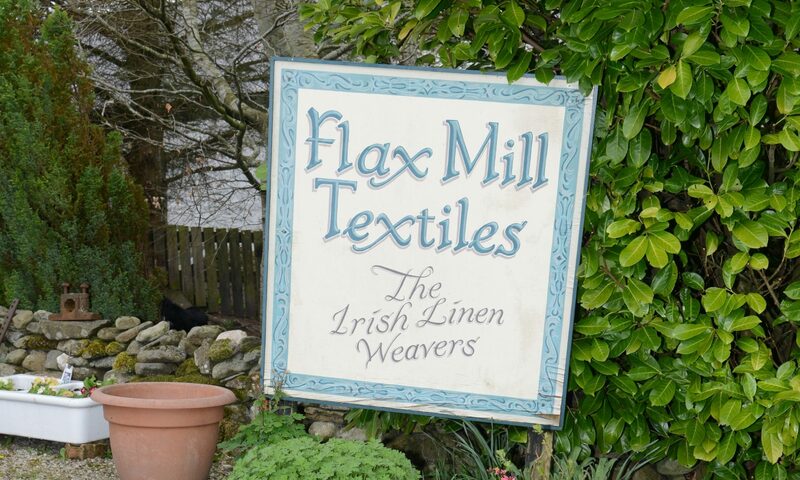 The largest event of this kind in Ireland will experience a “from flax to linen” demonstration with no match on this island and beyond! When we roll out we do it in style: I’ll be working “the baby”, our 130 year old handloom (90cm weaving width), our two “commission spinners” Sarah Foster –Jarden and Christine Casey are operating two spinning wheels in tandem, my husband Hermann will scotch a bit of flax on the hand-breaker and at least one of our team will be there to work a warp mill (for the first time). In other words: From the plant to the finished fabric – the thousands of visitors at Shanes Castle can experience the full process of linen making. The atmosphere there is a unique blend of natural beauty at Ireland’s largest private estate and a gigantic get-together of pioneers of the industrial revolution (30 + working steam-engines). The organisers are enthusiasts who have become friends, know and appreciate what we are doing and give us the space we need to demonstrate. Our stall and demonstration have become a real hub for textile people from near and indeed very far (this year we have folks from Germany, our production. If you come from Belfast – to mention one example – and want to stock up, just give us a buzz and we will have your order there. Treat yourself – join us at Shanes Castle on May 5th and 6th! Finally a word on our “car free” way of life since last December: It’s working excellent. For background, I have attached an article from the local paper in a previous news piece. I hope to meet up with you very soon, here at Flax Mill, at Shanes Castle or in Berlin, where we will spend a bit of time this year. Lorna Shannon making an appearance at Shanes Castle on May 5th! When we heard that our two master spinners Sarah and Christine (see above) will only be at the Steam Rally for one day (May 6th) this year, we got very worried. Not for long though, it wouldn’t be them, had they not found more than “stand-in” crafters. Sarah’s daughter Jeni Jarden, 19 year old up – and coming hand spinner will team with Lorna Shannon for the first day of the event. The secretary of the “Ulster Guild of Spinners, Weavers and Dyers” is certainly one of the most high – profile textile workers in this part of the world. Yorkshire born and with a base in Ballymoney, Lorna is a weaver and spinner with incredible skills and knowledge – a real privilege to have her with us for a day!